Whether you've gone out with your boyfriend 500 times or you are heading out on a first date, what to wear on date night has potential to be stressful! But I've found that pretty much any outfit that you wear during the day can be transformed for a date night by swapping the accessories. 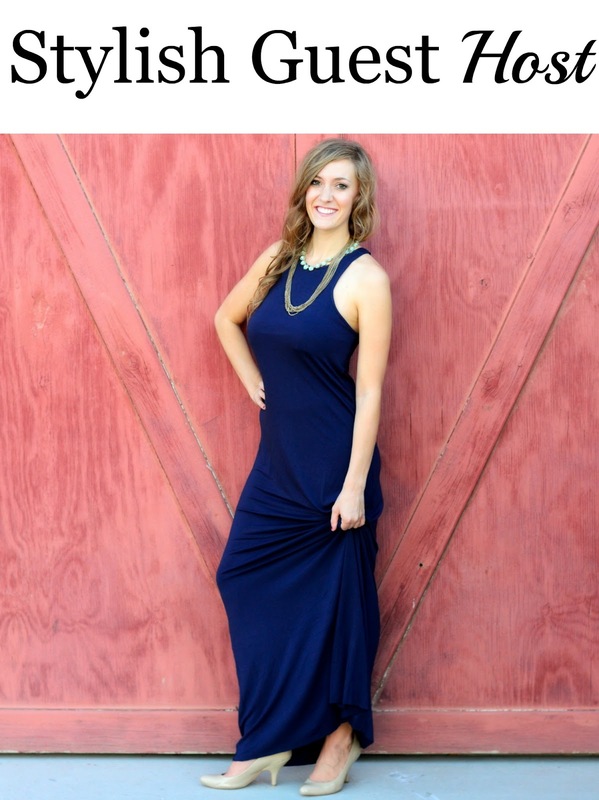 Read on for my day to date tips & then share your date night look in the week's link up! For day time, especially weekends, I am all about comfort. I LOVE this jumpsuit - the layered top is so cool and the fabrics are so soft, I feel like I am wearing pajamas! The pant cuffs immediately made me want to style this jumpsuit in a sporty way so I added my leather jacket, a pair of sneakers, sporty watch and my trusty backpack! For a quick change at night, I was able to lose the jacket and sporty accessories and add girlish more refined pieces like a statement necklace, an oversize clutch and a pair of heels all while keeping the same basic jumpsuit! The idea of switching up accessories is great for weekends, but especially helpful during the week when you are off to grab a bite to eat after work. Changing up your bag & shoes and adding some jewelry can transform an entire look without even having to open up your closet! What is your favorite date night accessory? 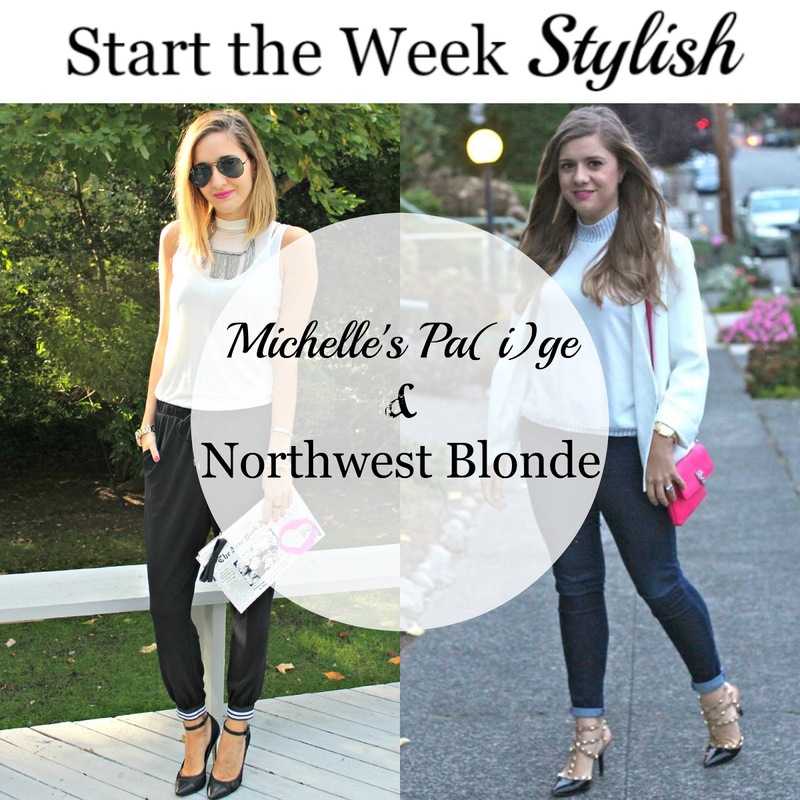 Meet our co-host for this week's Start The Week Stylish linkup: Robin from Penn & Quill. Robin is a fashion & lifestyle blogger based in Arizona, who shares tips and tricks to living a healthy life, while looking and feeling your best! Be sure to stop by her blog this week and say hello! We loved seeing so many statement making accessories last week. Our favorites were Cynthia from My Rose Colored Shades & Jill from Doused in Pink. It's on sale right now & the fabric is so super soft so I say go for it! Cute date night look, love the remixing here. Two gorgeous looks with your joggers, especially the first one. We are both thinking pants with pumps and cute little bags, for date night. Only you could pull off jogger this well. You already know I LOVE those heels. Such a fun transition with those cool kicks. Thanks so much! This jumpsuit is so comfy & I love that it works for day or night! Both looks work perfectly! Thanks for the inspiration. I love how you've taken a more casual outfit and dressed it up. This is the epitome of sporty chic! Thanks so much! It's crazy what a change accessories can make! Wow! I can't believe that is a jumpsuit. If you had not told us I would have thought it was two separate pieces. I love it. I also love how you switched it from day to night. You look great in both looks. I love one pieces! One less item to put on in the mornings :)! This one is super versatile & comfortable! Loving both looks, Michelle, and especially that clutch! So great! Thank you - it was an impulse buy that I'm so glad I bought! Cute outfits! Loving the black and white combos! Only you could make a pair of joggers look so elegant! Gorgeous outfits! Thank you! A classic black and white jumpsuit is a great starting point for any style! Love this sporty look and love how you transitioned it from date night to casual. I seriously would wear joggers every day if I could. And thanks so much for the feature! They are so comfortable & this jumpsuit has the softest fabric! We love your style! Gorgeous! I love how you styled this both ways and really love your lip color! Love your joggers! Both of these sporty looks are adorable! You are so sweet to feature me! Thank you! Thank you for linking up with us each week! We love your style! Love this jumpsuit and how you styled it. Perfection! Love how you transitioned from day to night! Those are my favorite types of outfits, so easy to slip on heels and a necklace and you're ready to go! Thank you so much for letting me join in on the fun this week and cohost with you! Love your joggers and that jcket!!! I wish I looked half as cute in joggers as you do! Love it! Thanks so much! This jumpsuit is SO comfortable! I always love how a few change in accessories can give a totally different look. Love both looks and love your clutch! I agree! It's so nice when an outfit is versatile enough for day & night! Love everything about your sporty chic styling, Michelle! Stunning in leather jacket, dear. Thank you so much :) So glad to hear you like it! This is such an awesome look! I love that you styled it 2 different ways classic and sporty love it!!! I also love that clutch such a nice statement piece!!!! Love your jumpsuit and how you styled it for both day and night. What a difference the accessories can make! Crazy right?! It was so fun to think of new ways to style this look! Those joggers look so comfy! I love your Nikes with them! Thank you! These sneakers come in a bunch of different colors - I love them! The jumpsuit is unique! I like how you styled it for both day and date night. Have a nice week! Super cute and comfy looking! Love how you can glam the jumpsuit up with heels and pretty accessories. Totally - this sporty piece can totally be made chic & girly depending on the accessories. I love this look paired with the sneakers! I am all about casual! Me too - but I love to dress up for nights out. This look was the perfect transition. This is a perfect day to night outfit - I'm loving these pants on you! Thank you - would you believe it's a jumpsuit?! Love how you styled this! Can't believe its a jumpsuit.